For a second weekend, protests raged across America and for a second weekend the Los Angeles Chamber Orchestra’s serendipitously timed “Left Every Voice” festival promoting peace and reconciliation carried on to its ambitious, poignant conclusion. LACO, in collaboration with UCLA’s CAP program, director Anne Bogart, and members of the SITI Company revived Kurt Weill and Maxwell Anderson’s Lost in the Stars for two performances at Royce Hall. 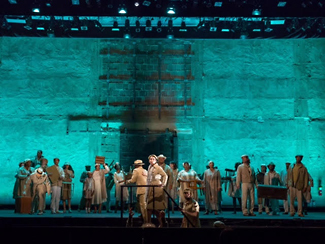 The musical has been revived periodically since its 1949 debut on Broadway, but it has never been the most familiar of Weil’s works - which is a shame considering the richness of the score and material. The show is a stage adaptation of Alan Baton’s apartheid era novel Cry, The Beloved Country. It concerns a black Anglican priest who has gone to find his son in the city of Johannesburg only to find he has fallen into a variety of sins including the eventual murder of a white friend of another family from the priest’s village. It’s stirring stuff and the themes are ones dear to Weill’s heart. But the music harkens to other influences including what Weill identified as Zulu tribal music. The story covers a lot of ground even if it does go to predictable places for a contemporary audience. But it was hard not to admire the sheer ambition and effort that all parties had put into the production. Jeffrey Kahane and the LACO players were forceful and gave a real edge to the score. It was a similar approach to their performances of Weill from last week and it provided a counterweight to Bogart’s sometimes slow and often ritualistic staging. The large cast operated in a sparsely decorated space that relied heavily on lighting to evoke its sense of place. Anchoring the cast were two excellent performances from Justin Hopkins as the priest, Steven Kumalo, and Lauren Michelle as Irina, his son’s now pregnant partner. Michelle appeared alone on stage for her big solo numbers but she easily carried those moments that were by far the most riveting of the entire evening. The eventual reconciliation of the story may seem comparatively easy to an audience facing the current political climate that Sunday night’s was. But it was a message of hope that is sorely needed right now. And LACO should be commended for the ambition of the endeavor, perhaps one of the biggest undertakings the orchestra has made in years. The topic of how the arts should respond to political upheaval has unsurprisingly been in the news again. And given the events of last weekend, how could it not be? But regardless of what the arts can or should do, Los Angeles audiences were reminded this weekend of some of what they already have done for centuries in very pointed and dramatic ways – build community and provide a space to dream of a better world. Take the Los Angeles Master Chorale for instance. The performances of Beethoven’s Missa Solemnis this weekend had been scheduled for months and months. But here the large chorus, orchestra and Artistic Director Grant Gershon were playing grand music about the deepest questions mere feet from some of the largest protest crowds this city has ever seen streaming past their doors on Saturday afternoon. And if the challenges humanity presents weren’t enough food for thought, nature itself stepped in on Sunday night challenging everyone in attendance with one of the largest winter storms the region has seen in quite a while. The LAMC and the near capacity crowd responded superbly. Gershon addressed the audience from the stage noting the connection between recent events and Beethoven’s massive final meditation on the nature of the world to come and meeting suffering and tyranny with belief in something better. It was a gutsy and heartfelt performance that focused less on the very good soloists recruited for the evening (including a very welcomed local return of Rod Gilfry) and more on the chorus and ensemble as a whole. Gershon was looking for the universally human in this performance and while polish and finesse sometimes took a back seat, no one could argue with how heartfelt and sincere the evening was. Meanwhile, across town, The Los Angeles Chamber Orchestra found itself in the midst of a major programming initiative for this season concerning similar themes. “Lift Every Voice” is a series of programs designed to encourage understanding and promote peace inspired by the lives of Rabbi Joachim Prinz, Kurt Weill and Martin Luther King, Jr. The concerts and lectures in the series have featured contributions from a number of guest performers including violinist David Hope who was on hand to perform Bruce Adolphe’s Violin Concerto “I Will Not Remain Silent” and arrangements of several Weill songs by Paul Bateman for violin and orchestra. These were paired on Saturday with Weill’s Seven Deadly Sins which were headed by vocalist Storm Large. Weill’s song cycle, like all of his work, bursts with theatricality and Ms. Large has made it her specialty in recent years. She‘s undoubtedly charismatic and versatile enough to make these songs sing with a weariness and trepidation that echo these current times so closely — they have an extra punch right now. The LACO musicians were no less dramatic with their taut performance of the score. But perhaps the highlight of the evening was Jeffrey Kahane’s own comments from the stage at the start of the evening. He too noted how unexpectedly poignant this programming series had become in the wake of the disastrous scenario our country now faces. By tying in themes from Mozart’s operas he built an argument for these works that remind us of the good we are capable of making together, speaking out, and standing up to tyranny. He touched many in the audience including myself. Better yet is the fact that there are more performances for LACO next weekend when they will bring a staged performance of Weill’s Lost in the Stars to UCLA on Saturday and Sunday in collaboration with SITI Company and director Anne Bogart. It’s a rare opportunity to hear Weill’s late Broadway gem and is a must see for local audiences.